SYNTHONIA is committed to ensuring that your privacy is protected. This policy explains how we use the information we collect about you and the procedures that we have in place to safeguard your privacy. When you register with SYNTHONIA and/or place an order, we need to know your name, delivery address, Paypal email address, e-mail address and telephone number. These data allow us to process your orders and notify you of their status. We may also ask you to give us optional contact information, (i.e. your fax number) as well as demographic information (i.e. your age). We may from time to time,send, together with your ordered products, files and flyers advertising the goods or services of unrelated third party companies. We do not pass on your personal data to these companies. If you purchase a ticket through SYNTHONIA Tickets we will share your ticket purchase and contact details with related third party companies in order to let them deliver your ticket to you. From time to time, SYNTHONIA and the ticket provider or promoter of the event for which the ticket has been purchased may send you information about the latest events, hot tickets, exclusive offers and other similar products and services they offer (which will include the SYNTHONIA tickets weekly newsletter). Should you wish to opt out from receiving such information you can do so at the time of purchasing your ticket, or by clicking the "unsubscribe" or "edit my preference" links at the bottom of every mail you receive. We may also use your information for the purpose of providing you information about any special offers or features of our web site we think may be of your interest and for related marketing purposes. We use your IP address to help diagnose problems with our server and to administer our web site. Your IP address is also used to help us identify you and your details on our database. We monitor customer traffic on an aggregate basis in order to help us develop and improve our web site for the benefit of our customers. In order to enhance your use of the web site you will be given a session ID which will only last for the duration of that visit to the site. Each time you visit the site you will be given a different session ID. To ensure that your data are not being used without your consent, we will validate name, address and other personal information supplied by you during the order process against appropriate third party databases. By accepting these terms and conditions you consent to such checks being made. In performing these checks personal information provided by you may be disclosed to a registered Credit Reference Agency, which may keep a record of that information. You can rest assured that this is done only to confirm your identity, that a credit check is not performed and that your credit rating will be unaffected. All information provided by you will be treated securely and strictly in accordance with the Data Protection Act 1998. Cookies help us to recognise you when you next visit our web site and choose the advertisement displayed to you. This allows us to tailor the service we provide to your preferences. You can usually change your browser preferences so that it will not accept cookies. 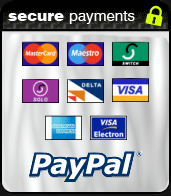 We use paypal as our preferred method of payment which is safe and reliable. Unless we have your express consent, we will only disclose your personal data to third parties if this is required for the purpose of completing your transaction with us. This is subject to the provision that we may disclose or transfer your data to a partner company where you have supplied information via a site which is co-branded with that partner company or to members of our own group who operate SYNTHONIA branded websites or websites affiliated to those websites (including but not limited to the sale or provision of digital content, tickets and other related products). If personally identifying data about you may be shared with a partner company, we will tell you before we collect or transfer such data so that you may opt out of this transfer if you wish. SYNTHONIA may however provide aggregate statistics about our customers, sales traffic patterns and related site information to reputable third-party vendors and relevant affiliate partners, but these statistics will include no personally identifying information. We may also release account information where we believe in good faith that this release is reasonably necessary to comply with the law. The nature of Internet communications means that your communications may be susceptible to data corruption, interception and delays. SYNTHONIA shall not be responsible for any detrimental reliance you place on this web site or its contents. All SYNTHONIA branded websites and their content (including any downloadable data or software) are provided on an 'as is' basis and SYNTHONIA makes no representations or warranties of any kind with respect to such websites or their content and disclaims all such representations and warranties, whether express or implied, to the fullest extent permitted by applicable law. In addition, SYNTHONIA makes no representations or warranties about the accuracy, completeness or suitability for any particular purpose of the information and related graphics published in this site or that any software or the server that makes it available are free of viruses or other harmful components. Information stored in this site may contain technical inaccuracies or typographical errors. All liability of SYNTHONIA howsoever arising for any such inaccuracies or errors is expressly excluded to the fullest extent permitted by applicable law. Neither SYNTHONIA nor any of its directors, employees or other representatives will be liable for damages arising out of or in connection with the use of this site in any way. This is a comprehensive limitation of liability that applies to all damages of any kind, including (without limitation) compensatory, direct, indirect or consequential damages, loss of data, income or profit, loss of or damage to property and claims of third parties. SYNTHONIA websites may contain hyper-links. These hyper-links connect you to sites belonging to other organizations which are not under our responsibility. We have used our reasonable endeavor in preparing our own web site and the information included in it is done so in good faith. However, we have no control over any of the information you can access via other web sites. Therefore, no mention of any organization, company or individual to which our web site is linked shall imply any approval or warranty as to the standing and capability of any such organization, company or individual on the part of SYNTHONIA. All design, text, graphics and the selection or arrangements thereof are the copyright of SYNTHONIA or of other copyright owners. Permission is granted to electronically copy and print in hard copy portions of this site for the sole purpose of placing an order with SYNTHONIA, or using this site as a shopping resource. Any other use of materials on this site (including reproduction for purposes other than those noted above and modification, distribution, or republication) without the prior written permission of SYNTHONIA is strictly prohibited. SYNTHONIA is the exclusive licensee of the SYNTHONIA trademark. All other trademarks, product names and company names or logos used in this site are the property of their respective owners. No permission is given by SYNTHONIA relative to the use of any such trade marks, product names, titles or logos and such use may constitute an infringement of the holder's rights.